St. Joseph, protector of the Holy Family! St. John BoscoDear Family of Mary! Fr. Maximilian has been guiding us spiritually through the English Mass in Medjugorje during this time when Fr. Leon has been called away. I have transcribed Fr. Maximilian’s opening remarks before Mass on January 30, 2019. I feel that Fr. Max has hit upon a very important aspect of God’s plan at this time in Medjugorje. That aspect is the role of St. Joseph! Denis and I have been entrusting Mary TV to St. Joseph in a special way for a long time (especially through Br. Andre Bessette). And St. Joseph has done many incredible miracles for Mary TV. But I never understood the important role that St. Joseph has for Medjugorje until I heard Fr. Max speak yesterday. In the grace of Our Lord Jesus Christ, and the love of God, and the fellowship of the Holy Spirit through the Immaculate Heart of Mary, our Mother, be with you all! Amen. We just sang “Laudato si” which is a song that comes forth from the words of St. Francis. He praised the Lord for the beauty of creation. We all know this prayer of St. Francis and we should do that prayer in the morning, singing songs of praise that our life may become a song of praise. And giving thanks is always the very best prayer to make. In the morning, one of the visionaries, Vicka, said it is the prayer that ties us to God because it is an act of love. To recognize the love of God and the beauty of his love in all things, all happenings, in all creation. So now we are gathered around the altar of the Lord to celebrate the redemption of all creation. The redemption of each one of us. Holy Mass is full of wonder, full of awe which we will never be able to understand as Mary has said in her messages. 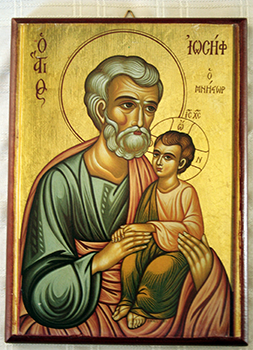 Today, Wednesday, we want to celebrate in honor of St. Joseph, for he is a hidden saint who we have to discover. Because God entrusted to him the greatest treasures, His Son who yesterday in the Gospel told us that we can all become His brother, sister, even mother! So, He invites us to become even Mary. But He never said to anyone, become my father. The father is only God the Father! But Jesus called, as we know, when He was a little child and He looked at Joseph, He called him “Abba” – Father! What did He see in the face of Joseph? What was the feeling of Joseph when he heard the Son of God calling him “father”? His humility, his virtues…if we could get some of his virtues. But he wants to give them to us. And who was closer, besides Jesus, to Mary than Joseph himself? Because he had the sacrament of marriage with Mary! So, he knows Mary! He protected Jesus and Mary several times. You know in the Gospel. And therefore, Mary here together with her Son Jesus, is making an incredible work of evangelization for mankind, for the world. There are saving plans for the whole world here in Medjugorje! So, we have to entrust Medjugorje to St. Joseph! We have to understand that this is an important step to take, so that he may protect and guide as a father, in the father role. We should especially pray every day for Archbishop Henryk Hoser. He is the bishop that the Holy Father has entrusted Medjugorje to, that he may be enlightened, that he may always be as wise as St. Joseph, and he will protect the creature of Mary in a certain way because she is working here most extraordinarily. So, let’s call upon St. Joseph as he was introduced into the mystery of God like no one else, and he had such an important role to play that if he would have failed, the whole history of redemption would have stopped, would not have been accomplished. His role was so important!! But now Mary says, “Your role! You can’t imagine the greatness of your role!” Therefore, she calls us to collaborate with her totally. To give ourselves totally into her hands. To be docile to the Holy Spirit, who wants to guide us into prayer on the way of holiness. Into oneness with Christ. Therefore, let us call upon Him right in the beginning of Holy Mass, as we do always. For without Him there is nothing good that we can do. Nothing good in the sense of how God understands good. That perfection to which He calls us. Come, Holy Spirit, come in my heart. Sweet Holy Spirit, fill with your love…. Thank you, Fr. Max. Your words have ignited a fire! I feel the deep need for St. Joseph now, in every aspect of my life, and especially in the work of Mary TV. Dear St. Joseph, guide us and protect us, intercede for us and watch over us as we serve Our Lady in her plans in Medjugorje. May we be only and always a help to her. https://marytv.tv/wp-content/uploads/2016/12/MaryTV-Logo.jpg 700 700 Cathy Nolan https://marytv.tv/wp-content/uploads/2016/07/weblogo_sm_1.0.png Cathy Nolan2019-01-31 01:17:032019-01-31 01:19:35St. Joseph, protector of the Holy Family!